American social utopian traditions show that architecture is fundamentally driven by ideology. Faith in these ideologies, like the Shaker’s incarnational aesthetics and the Perfectionists’ “complex marriage,” infiltrated every aspect of these community’s daily lives, the objects they designed, and the architecture they built. Much like brand design in corporate culture today, which maintains a common aesthetic from iPhones to Apple stores (for instance), faith and ideology touches every aspect of design and lifestyle in early American social utopian communities, from spoons to mansions. The concept of utopia is commonly understood to exist outside of reality. But the architecture of social utopias like the Owenites, Oneidans, and Fourierists were often driven by theocratic and socialist ideals resulting in built architecture and objects that expressed these ideals. Many utopian ideological traditions quickly flickered out of existence, but would resurface later in many forms, from 1960s counter culture to the work of Mies van der Rohe. Architecture was the means by which Shakers and Hippies alike directly expressed their ethos and ritualized their lifestyles. Many utopian communities did not last beyond two or three generations (only three active Shakers remain in the world) and their planning visions were often rhetorical. In these drawings, the core design approach is to remake, appropriate, and hybridize references from worlds that are alien to one another. 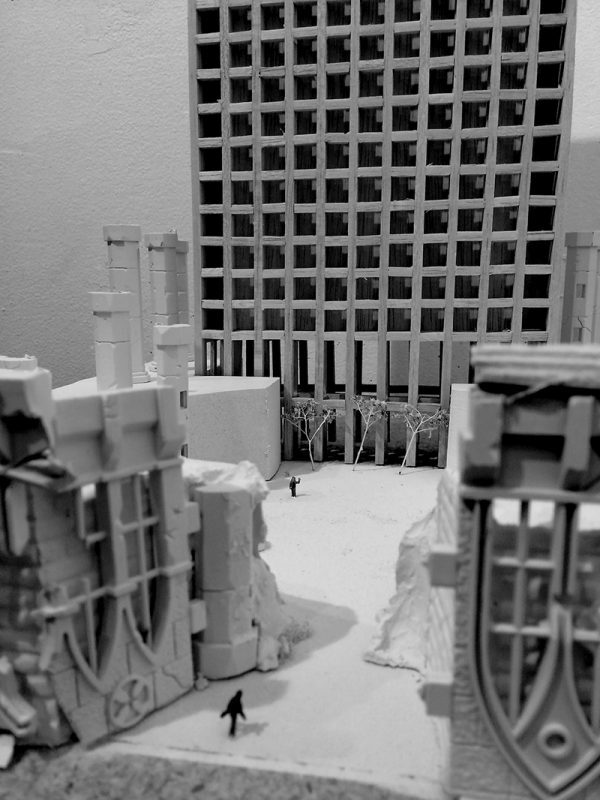 Stemming from the distinction between content and representation, this work synthesizes the ideals of social utopianism into a proposal for a building in Chicago with three parts: public space, a commercial plinth, and a tower of housing. 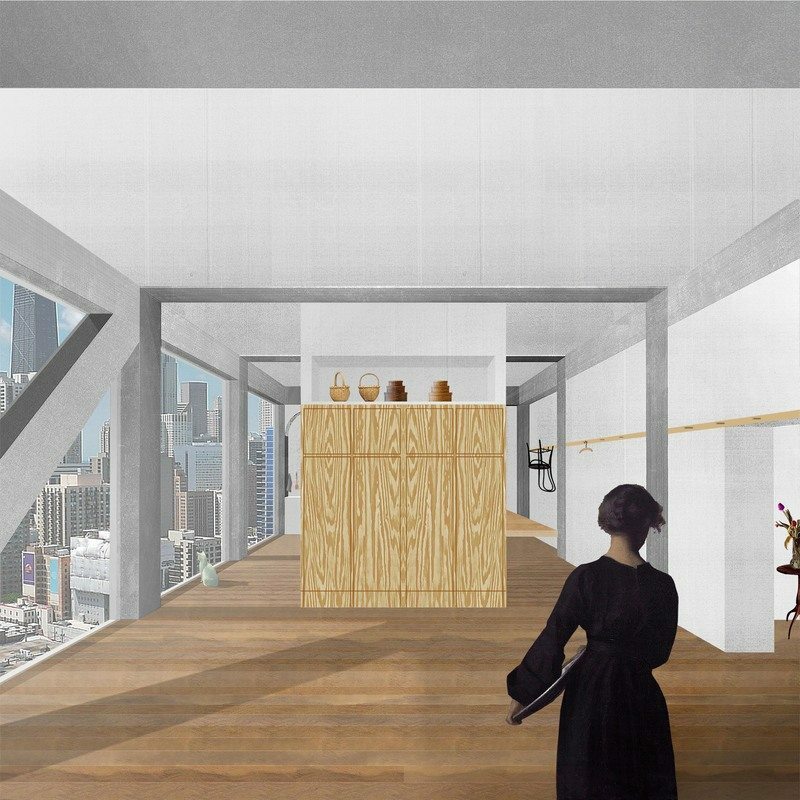 Within the tower, the domestic interior synthesizes the uncanny commonalities between the architecture of Mies van der Rohe and the Shakers (i.e., Mies’s “God is in the details” and the Shaker’s aesthetics of incarnation). These principles are accomplished above all via the construction of images, which surpass the plat distinction between virtual and real by devouring references in both pictorial form and deep representation. Mies van der Rohe’s famous idiom “God is in the detail” clearly influences the importance he attributes to detail. The furniture of both Mies and the Shakers contain a similarity that could only result from common ideologies. Although different in materials (Mies using steel and leather, the Shakers using wood and wicker) they both display an intense focus and attention to detail. With both, the furniture is simple and austere in geometry and form. However, where Mies’s version of modernism assumes a universal subject, the Shaker’s designs are tied to the theology and aesthetics of incarnation, and, rather than existing for everyone, are restricted to be used by the people within the isolated community from which they are produced. 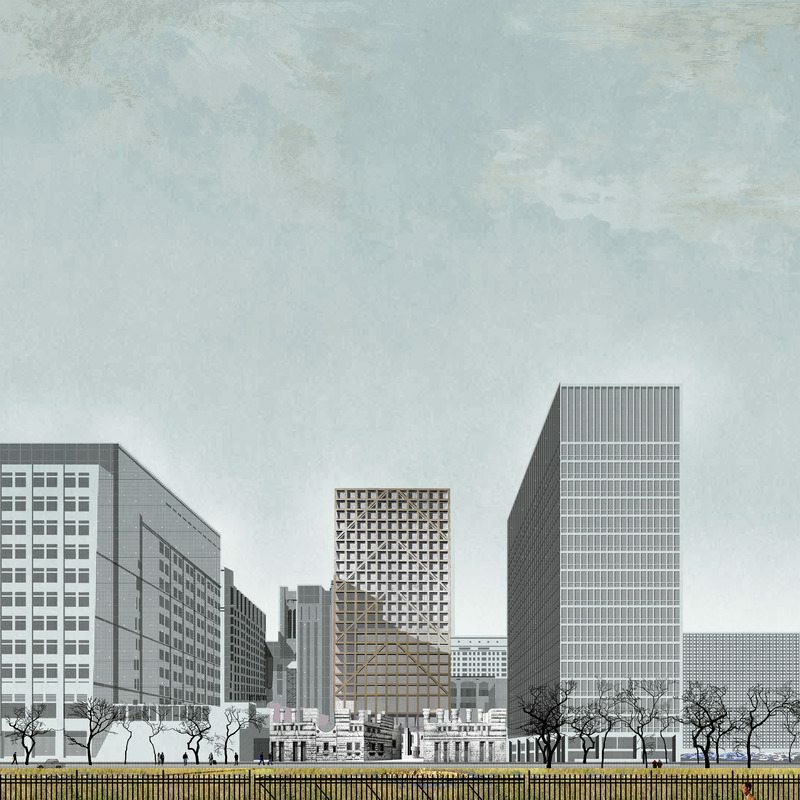 This shows that modernism, or at least Mies’s view of it, is itself a kind of faith. These parallel ideologies within different communities and time periods begs one to ask: What are the dreams and cults of today (and tomorrow)? Many cities, especially American cities, display a drought of invention and idealism. 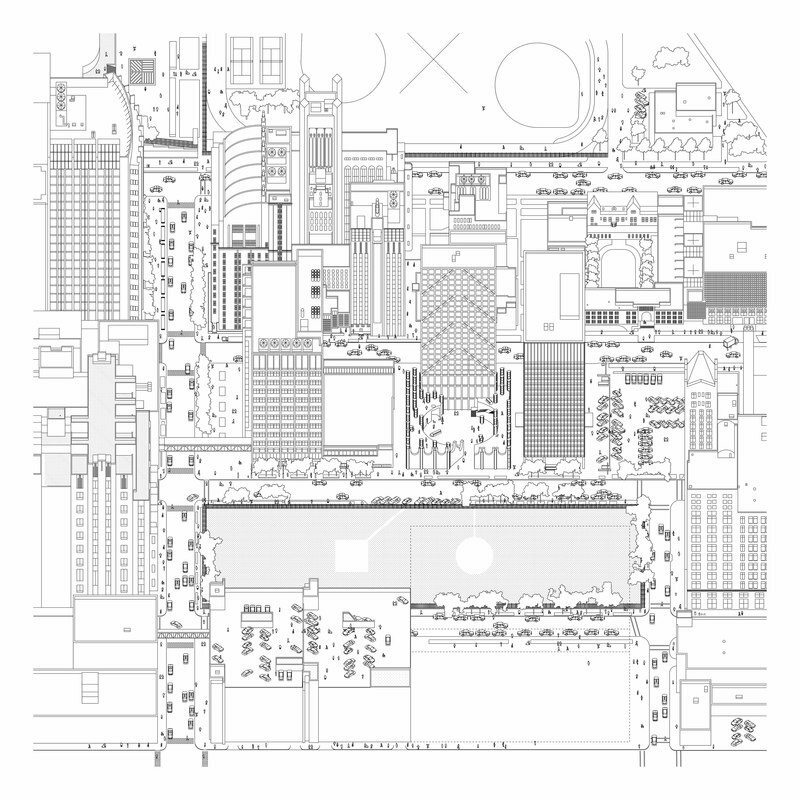 How can we reincarnate forms of utopian visions within the real senescence of the city? Can we concretize atomized culture and bring together combinations of interests to form new kinds of communities? What do we trust in, what faiths do we have, that can overcome the established forces of big business, municipalities, and corporate cultures that now owns the actual imaginings of the city? After Gericault, Digital, 2014. 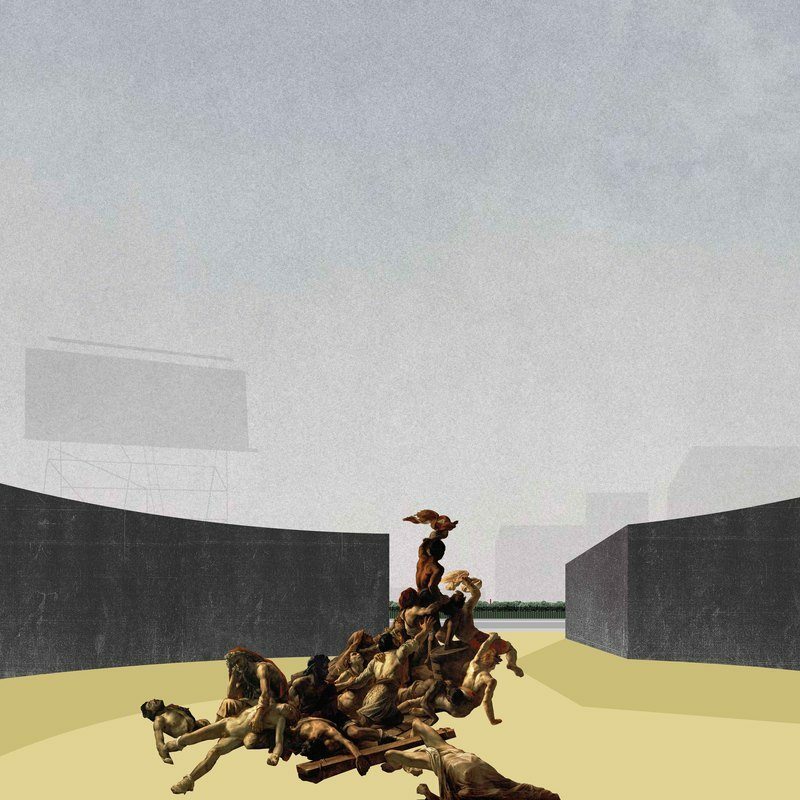 By placing together two unlike things (a fragment of Theodore Gericault’s first major work, The Raft of the Medusa (1818-19) and indications of architecture) together in the same perspectival space, the effect of depth between the active foreground and less active background illustrates the actual and representational space between viewer and picture. Interior collage, Digital, 2014. The domestic interior is represented here as consisting of qualities found in the architecture of Mies v.d. Rohe and the Shakers. The space is organized by a grid delineated by a concrete structural frame. The austerity of Mies’s interiors and the specificity of his material surfaces are compatible with the rituals and lifestyles of the Shakers—where they would hang objects on pegs and compress storage to simple volumes of casework. The commonalities offer a view of contemporary domesticity from historical understandings of space and forms of life. 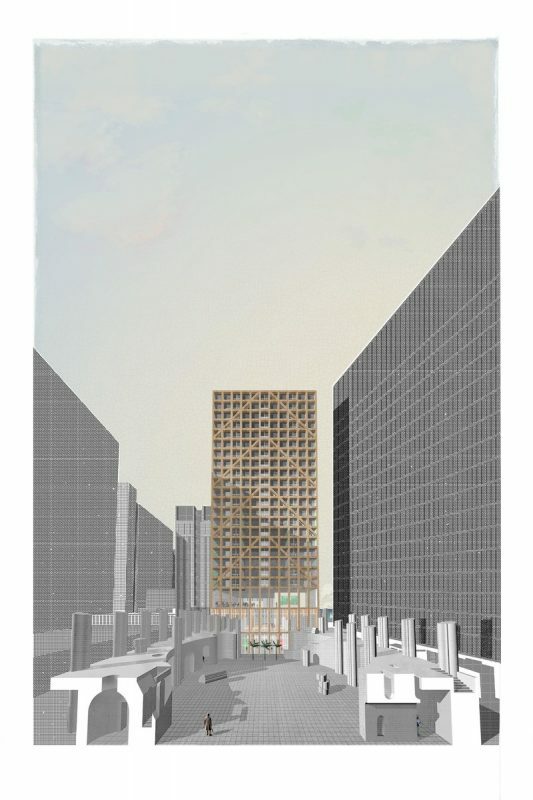 Perspective section from public courtyard, Digital, 2014. 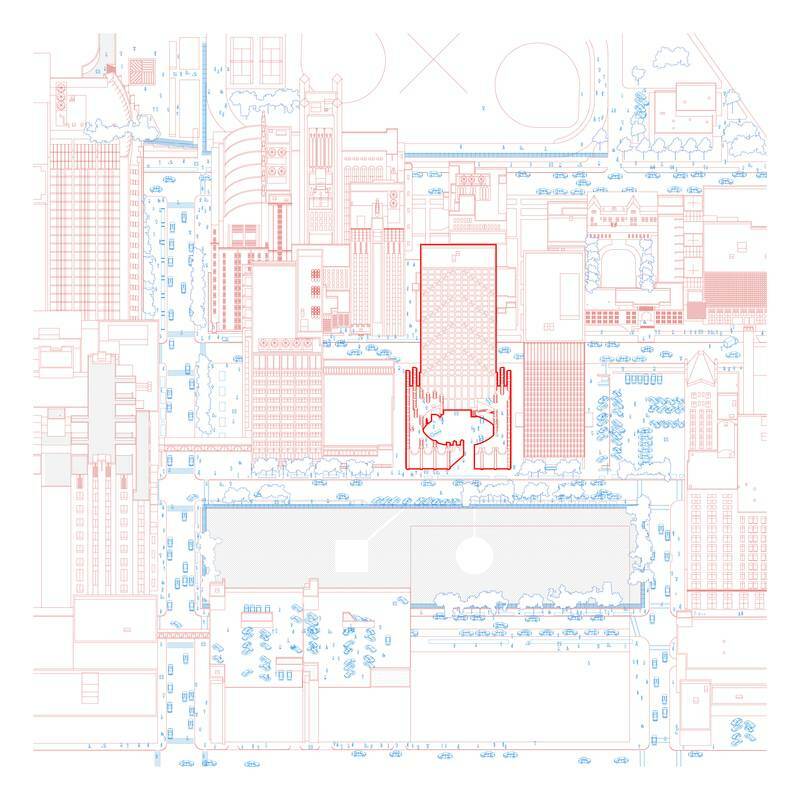 Axonometric view, Digital, 2014. Showing the building in the context of Northwestern University in Chicago. The building is a proposal for student housing for NW University. Mixed media. Ink on watercolor paper, graphite, and digital, 2014. 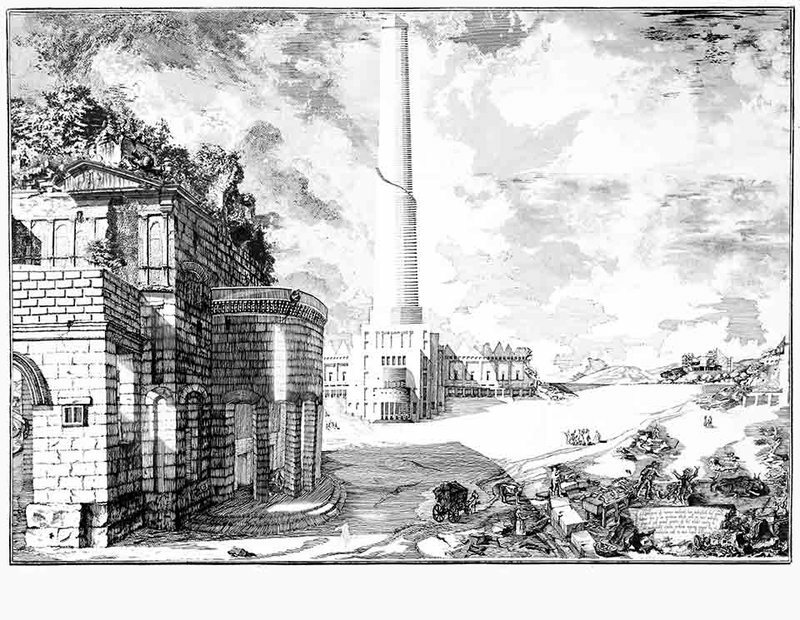 A vision of Robert Owen’s social utopian community of New Harmony, Indiana, in a state of Ruin, and in the manner of Piranesi. Model. Wood, with painted foam and battle ruin model pieces. 2014.